Theresa May made the announcement outside Downing street. BREAKING: Theresa May today announced a breakthrough in the Brexit process. It is understood that her latest deal gained a super-majority in Parliament, with 573 MPs opposing the deal and 69 supporting. 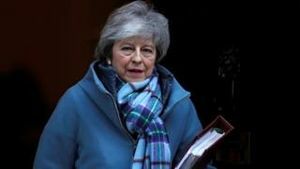 For several months May's Brexit deal had been blocked due to the Northern Irish backstop issue. The radical policy shift which broke the deadlock was announced just hours ago, with the Queen herself taking the rare constitutional action of terminating Northern Ireland's membership of the United Kingdom. This instantly solved the border issue with Ireland, while simultaneously completing the peace process started with the Good Friday agreement. It is understood that all British police and troops have been served with an eviction notice, and will withdraw from Northern Ireland within 14 days, Irish leader Leo Varadkar has confirmed that Irish troops will move in directly following the withdrawal, realising the long-held dream of a United Ireland. Shortly after the historic vote, a scuffle broke out in the House of Commons in which all nine of the DUP MPs in attendance were beaten to death by a coalition of Conservative and Labour backbenchers. It is understood that every single member of the Conservative and Labour parties backed the deal and that all other MPs opposed it. Surviving DUP MP Emma Little-Pengelly was stuck in traffic and missed the vote. She said in a statement to the press that she "was betrayed". UnNews understands she was later arrested by armed police, and faces charges which include 317 counts of High Treason. This page was last edited on 25 March 2019, at 16:45.